If 360-degree video isn’t your thing, here are a few star-spotting tricks in written form. The Big Dipper is in the northern sky, and around the world it is associated with the north. Its on the state flag of Alaska and the insignia of the North Korean army’s special operations unit. Slaves fleeing the American South told each other to “follow the drinking gourd.” Even the word arctic is a reference to this constellation: “arktos” means bear in Greek. So as the sun sets, look to the north. In the summer months, you’ll find the dipper tilted as if it’s spilling its contents. Once found, these stars can be used as guides to find other constellations. 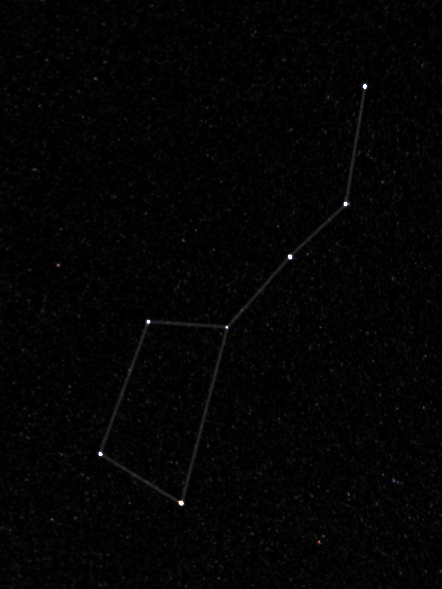 If you draw a line between the two stars at the dipper’s edge and keep going, you’ll hit Polaris, the North Star. If you begin at the Big Dipper, pass Polaris and keep going about the same distance again, you’ll find the distinctive “W” shape of Cassiopeia. In early summer, around sunset, begin at the two stars closest to the Big Dipper’s handle and follow their line into the western sky. If you look up and to the east, you’ll see a trio of bright stars: the iconic summer triangle. If you have trouble finding it, you can follow two stars from the Big Dipper across the sky to a star called Deneb. Deneb one of the most distant visible stars because it is so luminous — about 200,000 times brighter than our sun. You’ll find two more constellations floating above the southern horizon. A bright reddish star, Antares, marks the heart of a giant arachnid, Scorpius. The people of the Polynesian diaspora saw its barbed tail as the magical fishhook of the demigod Maui. Follow Skunk Bear, NPR’s science show, on YouTube, Facebook and Twitter.